Already in the 1890s William B. Coley injected streptococcal organisms in patients with solid tumors (“Coley’s Toxins”) to activate the immune system. Coley (1862-1936) was an American bone surgeon, cancer researcher and pioneer of cancer immunotherapy. He was convinced that post-surgical infections had helped patients to recover better from their cancer by provoking an immune response. Because of severe adverse effects due to the living streptococcal organisms, he switched to using dead bacteria. But Coley’s published results were difficult to interpret with confidence. "More research would be needed to determine what benefit, if any, this therapy might have for people with cancer" (American Cancer Society). Nevertheless, William B. Coley is known as the "Father of Immunotherapy". The immune system is able to control, at least in part, growth of tumors. In 1863 Rudolf Virchow discovered active leucocytes in tumor tissues. And it was Paul Ehrlich in 1909 who postulated a ‘body’s own protection system’ against tumor cells. ‘The immune surveillance hypothesis’ was born and elaborated by Thomas and Burnet in the 1950s and ‘60s: T-cell-mediated immunity evolved as a specific defence against cancer cells and that T cells constantly patrol the body, searching for abnormal body cells. Until today there are many clinical data demonstrating the correlation between the immune system/ surveillance and the development of tumors: Spontaneous remission of colon carcinoma, acute myeloid leukaemia, or remission of lung and liver metastases of lung cancer (NSCLC). As long as the tumor load is controlled by the immune system, as long as this balance between diseases and innate and acquired immunity works, the life is not threatened. The same is for infectious diseases. According to the statistics transplanted and immunosuppressed patients get an 3-8 fold higher risk to develop cancer. The incidence of malignancy in (kidney) cancer patients chronically immunosuppressed over ten years has been estimated at 20%. Immunodeficiency in humans is associated with increased cancer risk what is clearly demonstrated in HIV infected patients. In contrast, melanoma or colorectal patients whose tumors have high levels of tumor-infiltrating lymphocytes have a better prognosis. Taken together, there are compelling evidences that the immune system is to confer protection not only against foreign pathogens but also against cancer. If this were not so, the body would collapse within a short time. Our live would be a short episode only. Every day abnormal cells are produced somewhere in the body, are recognized by the immune system and eliminated. Whether this elimination is perfect or imperfect is not clear. Probably the immune surveillance leads to a balance between normal and abnormal cells. Pre-cancerous cells stimulate an immune response and are destroyed. But if the immune system can’t detect every malignant cell, and at the same time a suitable tumor microenvironment (TME) is formed by inflammatory processes, a carcinogenesis is not longer to be blocked. The mechanisms leading to immune tolerance against malignant cells are unknown. Pre-cancerous cells are the results of multiple mutations. Lethal mutations induce apoptosis, but other mutated cells might be recognized and destroyed by the immune system, others survive and their antigenic phenotype is immunologically silent and not recognized as “danger”: DAMPs are missing. DAMPs or alarmins. Danger signals are defined analogous to PAMPs as endogenous host-encoded proteins that are released after cellular stress, tissue injury and necrotic cell destruction, in the complete absence of any pathogen. Those molecules are collectively called damage-associated molecular patterns, DAMPs, sometimes also called alarmins. Many DAMPs are nuclear or cytosolic proteins, but also extracellular matrix proteins (ECM), which are either upregulated or released following tissue injury. These normally hidden proteins send a signal „danger“ resulting in a sterile inflammation. Substances in this process released from damaged cells, change now from the intracellular reducing to the extracellular oxidizing milieu, leading to a dramatical change of the extracellular redox milieu. The immune system has successfully edited these cancer cells and the cancer cells have their “lessons learned”. It is not surprising. The evolutionary mandate of life means to adapt to the environment, to permanently improve the genetic configuration, everything to do for survival only. The MDR (multidrug resistance) pump system in many cancer cells underlines this survival strategy, and immunediting is only another mechanism of the evolutionary survival strategy. Prophylactic cancer vaccines maybe an option in case of involvement of viruses such as human papillomavirus (HPV) and cervix carcinoma or other microorganisms. This anti-HPV vaccine is in a classical sense an antiviral vaccine only and can prevent a chronic inflammation. Genetic instability. Prophylactic cancer vaccines maybe no option for cancer diseases caused by other agents beside microorganisms. The high mutation rate in tumor cells can generate a mutational load of 1-10 mutations per megabase of coding DNA. The prophylactic selection of proper tumor antigens would be a lottery, an endless cycle of try and error. The genetic instability produces permanent changes of epitopes. Efficacy. The efficacy of therapeutic cancer vaccines is still disappointing. Since the first scientific report on an experimental autologous (personalized) cancer vaccine (whole tumor homogenate, mixed with Freund’s adjuvant and 3x injected intramuscularly in patient) was published 1964 the clinical efficacy of cancer vaccines was not as expected until today. Clinical validation remains elusive. The reduced efficacy of vaccines in the elderly is generally attributed to immunosenescence. Age-associated immune changes take place in the innate and acquired immune systems and affect not only lymphocytes, but also myeloid cells with a change in pro-inflammatory cytokines. The functional decline that characterizes aging begins after sexual maturity. Thymus involution begins with the puberty by the early teens. Immunosenescence. Immunosenescence is not limited only to the normal process of aging but also linked to chronic diseases or malnutrition. It’s a multicell and multifactorial process in the innate and acquired system. A multiple decline of major immune functions. This includes also the immunodominance: one epitope is dominant and trigger the response, all other epitopes are subdominant and don’t mount for an effective response. Immunosenescent individuals have a diminished ability for immunodominance resulting in a weak and more diffuse immune response. Immunosenescent B cells show an impaired ability to undergo immunoglobulin class switch recombination (CSR) measured by a reduced antibody production. Activation-induced cytidine deaminase (AID) is essential for immunoglobulin (Ig) gene CSR and somatic hypermutation (SHM). The AID expression in immunosenescent B cells is significantly reduced compared to young individuals. The correlation of immune dysfunctions and the development of tumors is also described, such as modification of T-cells, T-cell anergy, reduced expression of molecules of signal pathways, reduced cytokine production. The immune risk phenotype (IRP) is defined as CD4/CD8 ratio. In healthy conditions the number of CD4+ T cells is higher as the number of CD8+CD28- Treg cells (formerly called T suppressor cells) and the CD4/CD8 ratio is rarely less than 1.0. The ratio may drop as low as 0.1 during a progressive disease. Treg cells can damp the antitumor T cell response, therefore the number of Treg cells can be used as prognostic factor. There are lots of host factors from cytokines to B and T cell reactivity which can be used as determinants of a therapeutical vaccine response. 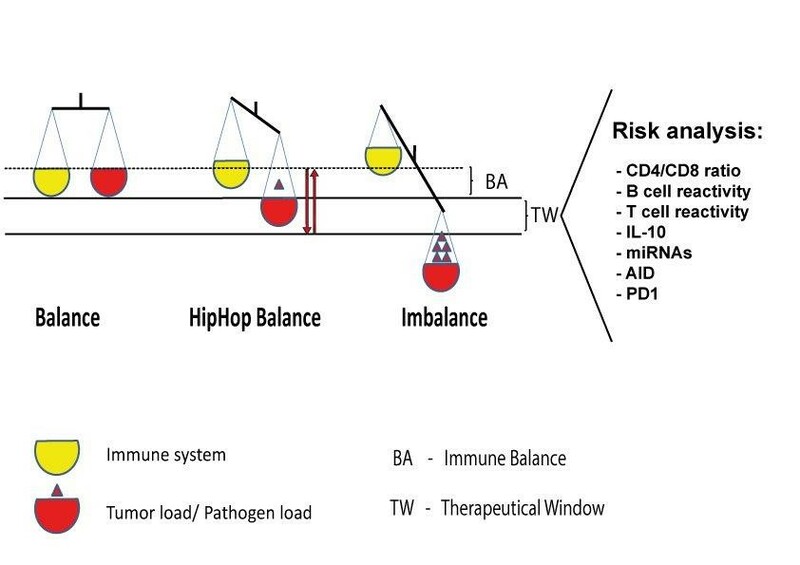 The HipHop balance is defined as an immunological condition in which the disease has partially destroyed some effector and regulatory functions but the immune system can recover and response to vaccination due its redundancy. This is the therapeutical window and should be defined for each personalized vaccine. Figure 1.21 Therapeutical window. The analysis of bodily fluids (blood, plasma, urine) can provide useful data on the current immune status of the patient. In healthy conditions, e.g., the number of CD4+ T cells is higher as the number of CD8+CD28- Treg cells and the CD4/CD8 ratio is rarely less than 1.0. Immunosenescent cells highly express senescence markers such as PD-1, CD57 and the overall activities of B and T cells are diminished. The status of HipHop balance gives a chance for therapeutical vaccination before the immunological imbalance gets irreversible. The first RNA cancer vaccine in man. CureVac Prostate Cancer Vaccine Candidate fails Phase IIb Trial (2017). CureVac's lead mRNA drug was the first RNA vaccine in man. "These results … pave the way for us to advance more potent prophylactic vaccine formulations into the clinic," said Ingmar Hoerr, CEO of CureVac. To be honest, the world is not waiting for another rabies vaccine but for the first therapeutical cancer vaccine. Time is of the essence! Immunotherapy by vaccination is possible but a question of timing. Immunosenescence, immune dysfunctions are not limited only to the normal process of aging but also linked to cancer diseases. It makes no sense at all to vaccinate a cancer patient suffering from loss of important immune functions. A risk analysis of several parameters before vaccination could help to understand the current disposition of the immune system: makes a therapeutical vaccination sense or not?